Moses is deaf and communicates primarily through sign language, although he can speak some. 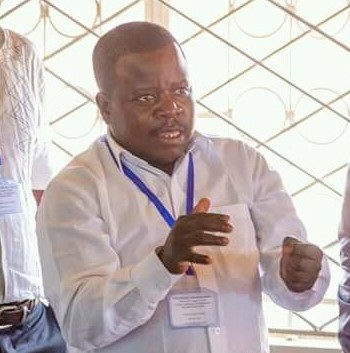 He is the co-founder of the Zambia Deaf Society, the interim Secretary General of the Deaf Leader Coalition, and a member of the Zambia National Association of the Deaf (ZNAD) and the National AIDS Council. For the past year, he has also been a faithful volunteer at the Lubuto Model Library. Already passionate about deaf education and teaching Zambian Sign Language, Moses found out about Lubuto from a friend at church who works in the Model Library and soon joined our volunteer team, filling a huge need in reaching out to deaf children and youth. Since then, he comes to the library three times every week to run a deaf storytime in Zambian Sign Language, holds information sessions on HIV/AIDS for deaf adults and teaches sign language to both the deaf and the hearing. Moses hopes to see a world were deaf people will be included and will have equal opportunities in all aspect of life, where they are respected and treated fairly. Through the Zambia Deaf Society, Moses has gotten involved in outreach to deaf children and youth in the community, advocating for the rights of the deaf to the general community as well as making these rights known to the deaf themselves. He addresses issues such as the importance of education, participation in voting during elections, sign language and good health care. We are thankful to have such a passionate volunteer pouring into the deaf children and youth at the Model Library, and we all benefit from Moses’ tireless advocacy for and empowerment of the deaf community of Zambia.